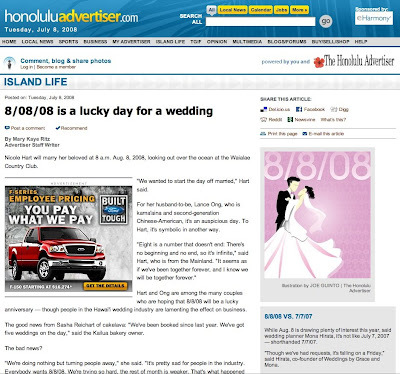 A couple weeks ago I was interviewed by Mary Kaye Ritz of The Honolulu Advertiser newspaper who was working on an article about the wedding date 8-8-08. When she asked if we had weddings that day, I impulsively said "are you serious? ", probably not the best way to answer that question, but just that morning I turned away another bride for 8-8-8, the trend since the beginning of 2008. It's actually quite painful to turn people away who seem to really want to hire you. Now that the venues are booked for 8-8-08 we're getting more brides inquiring about 8-7-08 and 8-9-08 -- sorry, booked. Last year for 7-7-07, which was just as busy, I started a waiting list, but none of the weddings cancelled (which is very rare anyway) and this year I decided to forgo the list altogether. Those who booked their vendors of choice early got lucky. One of the lucky couples was Jennifer Frazier and Mel Ona, who booked us in 2007 for their 8-8-08 wedding cake. They were also interviewed for the Honolulu Advertiser article. They have a spectacular cake planned for their 125 guests! While all the action seems to be around the 8th day of the 8th month in 2008, the rest of August is turning out to be insanely busy with some really cool cakes in the works. No rest for the wicked next month!